Finding the perfect shop in Otley, Yorkshire, spurred on Helen Parry to open Arundel Travel a year earlier than planned. She tells Abigail Healy how the business thrived. 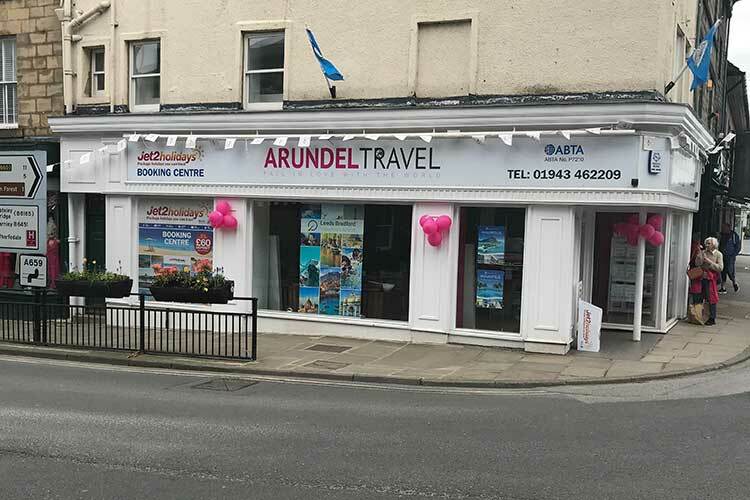 Creating a business plan from a sun lounger while on holiday sounds unusual but it was vital for Helen Parry, who opened Arundel Travel last December after spotting the perfect store in the summer. Previously a regional sales manager for Jet2holidays and in retail at Tui for 19 years before that, Parry had always dreamt of opening her own store. But things speeded up when Parry and her mum were walking around Otley and saw a shop available in an ideal crossroads location. “I always knew I wanted to open in Otley – I spent a while here when I was with Tui – I have family ties here and there is a fantastic local community. Seeing the shop was fate,” she says. Parry wasted no time – joining the Advantage Travel Partnership, recruiting two experienced sales consultants and opening the doors to Arundel Travel in December – just in time for the peak selling period. Arundel Travel now has more than 800 followers on Facebook, and although the team worked really hard at the outset, flyering local areas and farmers’ markets, plus sponsoring local teams and events, Parry says the social media channel has been their biggest business driver. “We post some deals, but it’s more about inspiration and encouraging people to think about trying somewhere new,” she says. Of course, there were lots of logistics such as back-office systems and electrics to contend with – but Parry says the biggest challenge she encountered when starting the business was re-educating people to book with a travel agent. Another smart decision that’s paying off for Parry is opting to open seven days a week. Offering opportunities to the next generation is also high on Parry’s agenda – having started out on Lunn Poly’s Youth Training Scheme herself. After achieving so much in just five months, Arundel Travel looks set for industry stardom, and with Parry at the helm it seems the local community and the youth of tomorrow’s travel industry will benefit too. Look carefully at the store location – I spent lots of time watching footfall in the town and seeing how this shop compared with that shop. Do as much market research as you can. I did questionnaires around town and asked friends of my parents, my brother and my friends for their opinions to get as broad a demographic range as possible. Make sure you have a support group you can trust – I was really lucky to have the Yorkshire Focus Group so I could ask anything confidentially. are making the right move. Have fun and enjoy it – you’re unlikely to become a millionaire, but working in travel is such a privilege – when you think you are responsible for a family’s one holiday a year, that’s a privileged position to be in.